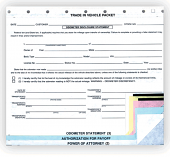 Item Size: 5 2/3" x 9 1/2"
Vehicle Odometer Disclosure Statement for auto dealer supplies: These Vehicle Odometer Disclosure Statements are 3-part carbonless. 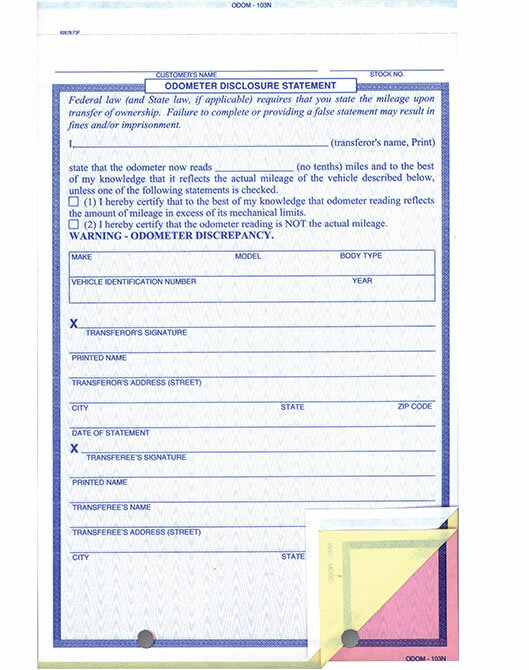 This Vehicle Odometer Disclosure Statement will line up perfectly on any pre-programmed printer and replace all competitor’s forms. Complies with all Federal Mileage Disclosure Laws. This is a Reynolds & Reynolds compatible Vehicle Odometer Disclosure Statement. Samples available for you to try on your equipment. Printed in blue ink. COMPARE OUR PRICE to Great American Automotive Products. THEY'RE MORE EXPENSIVE … American's Price is 100 @ $25.00 -BFA103 … for their odometer statement. Excellent quick service for the products I was looking for.